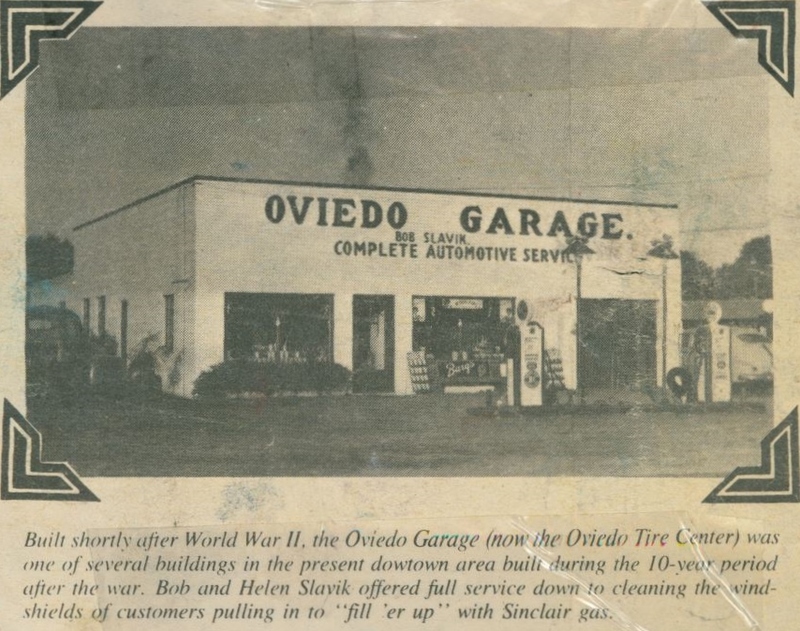 The Oviedo Garage, a complete automotive service business located at 139 North Central Avenue in Downtown Oviedo, Florida, operated by Bob Slavik and Helen Slavik. The garage was built within the first decade after the end of World War II. The Slaviks resided at 435 North Lake Jessup Avenue. Helen Slavik also served as the city clerk from 1965 to 1968. Together, the couple had one child, Roger Slavik. 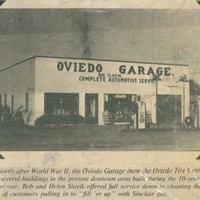 At the time that this photograph was printed in The Seminole Outlook, the building was owned by the Oviedo Tire Center. The site later became the location of the Townhouse Restaurant, which has since been demolished for road improvements. "Oviedo Garage by Bettye Reagan." RICHES of Central Florida. https://richesmi.cah.ucf.edu/omeka2/items/show/6972. Reagan, Bettye Jean Aulin. “Oviedo Garage.” RICHES of Central Florida accessed April 26, 2019, https://richesmi.cah.ucf.edu/omeka/items/show/6944.